[T]he Department of Education’s Office for Civil Rights (OCR) released Disability Rights: Enforcement Highlights published to commemorate the 39th anniversary of Section 504, and reviewing OCR’s work over the last three years to enforce this important civil rights statue. Disability Rights: Enforcement Highlights describes how OCR has worked to ensure the protections of Section 504, as well as Title II of the Americans with Disabilities Act, in schools and colleges. 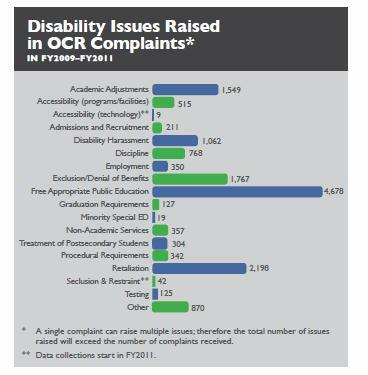 In the last three fiscal years, OCR has received over 11,700 disability-related complaints – more than ever before in a three-year period, and more than half of the total complaints received by OCR during this period. Since January 2009, OCR has also launched more than 30 systemic, proactive investigations that address a broad range of disability-related issues in institutions across the country. And, the office has issued multiple policy documents guiding schools and universities in how to meet their responsibilities under federal disability rights laws. The document also reports on data culled from the Civil Rights Data Collection (CRDC), released by OCR in March of this year. The CRDC surveyed 72,000 schools teaching 85 percent of America’s students, and its data showed that inequities for students with disabilities remain a reality in many of America’s schools. For example, nearly a third of school districts in the sample reported at least one incident of bullying or harassment on the basis of disability. And, students with disabilities represent 12 percent of the sample, but nearly 70 percent of the students who are physically restrained by adults in their schools.